The InSinkErator F-201R Replacement Water Filter is for use with the F-201 Filtration System, designed specifically for InSinkErator Instant Hot Water Dispensers. The F-201R water filter improves your drinking water by reducing chlorine taste and odor for a clean, refreshing taste. The F-201 replacement water filter is NSF Standard 42 listed. Sanitary Quick-Change Filter Cartridges make cartridge replacement fast and easy, without contact with used filter material. Upgrade to the F-601R Replacement Water Filter to reduce chlorine taste and odor, lead, mercury, asbestos, cysts and other contaminants for cleaner, healthier water. The F-201R water filter can also be adapted to refrigerators, icemakers, or virtually any drinking water system. 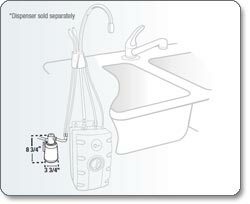 For optimal performance, InSinkErator recommends replacing your water filter cartridge every 6 to 12 months. 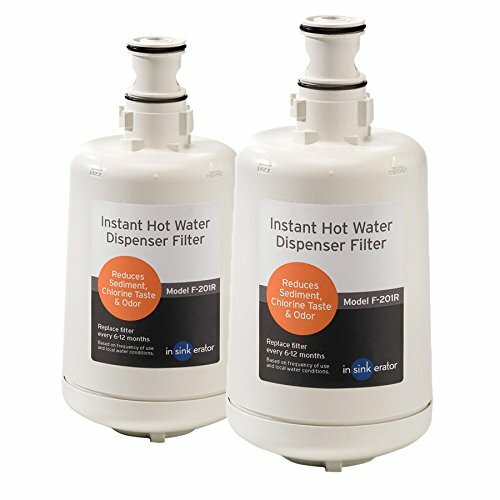 The InSinkErator F-201R Replacement Filter is for use with the F-201 Filtration System, the only system designed specifically for Instant Hot Water Dispensers. The F-201R filter improves your drinking water by reducing chlorine taste and odor for a clean, refreshing taste. The F-201 Filter is NSF Standard 42 listed. Sanitary Quick-Change Filter Cartridges make cartridge replacement fast and easy, without contact with used filter material. Upgrade to the F-601R Replacement Filter to reduce chlorine taste and odor, lead, mercury, asbestos, cysts and other contaminants for cleaner, healthier water. Both filter models are designed specifically for Instant Hot Water Dispensers, but are also ideal for refrigerators, icemakers, or virtually any drinking water system. InSinkErator's under-counter filtration system enables consumers to forgo plastic water bottles and rely on tap water to be the primary source for drinking, cooking and preparing hot beverages. Consuming water is an important part of our daily lives, considering it makes up about 70 percent of our body weight. While it is reported that a healthy person can live without food for weeks, a person can only survive a few days without water. The United States offers its citizens one of the safest water supplies in the world. Even so, many consumers are using home purification systems to help ensure the best tasting and safest water for drinking and cooking. In addition, others are consuming bottled water for reasons of both convenience and safety. As for safety, many people throughout the country have no qualms about drinking tap water due to regular testing and monitoring by government agencies to ensure it is safe. 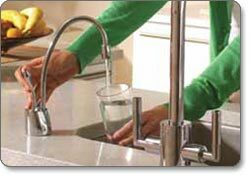 Drinking water can reasonably be expected to contain at least small amounts of some contaminants. As long as those contaminants are at levels no higher than EPA standards, the water is considered safe to drink for healthy people. There are also cases where water may go unchecked. Many homes are on private wells, not municipal water, and therefore have no EPA regulation. But numerous consumers still seek cleaner, better tasting water, as evidenced by the billions spent on bottled water each year. And because of recent reports that some bottled water supplies come from municipal water - not pristine water sources as promoted - coupled with questions about the safety of the plastic used in many water bottles and their environmental impact, consumers are left wondering what other options exist. The InSinkErator F-201R Filter Cartridge makes replacement easy. A simple twist is all it takes! A 6-12 month time span is recommended for filter cartridge replacement (it is recommended that all carbon filters be replaced within 12 months), and the filter system automatically shuts off water when the filter cartridge is being replaced. 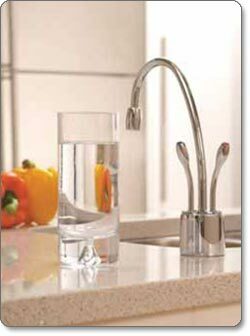 This system is ideal for use virtually anywhere filtered water is needed, such as with ice makers and refrigerators. InSinkErator F-201R Replacement Filters (2 included).